I reviewed another of these compilations in the last issue of Music Street Journal. 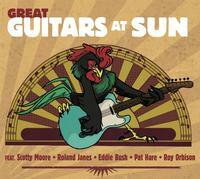 Here we've got a collection of old school music that was released on Sun Records. The focus here is on music with some great guitar work. I have to say that I like this disc better than the previous one (that was about the drums). It's worth the price of admission for a handful of the songs, but nothing here is in the "skip it" category. It's solid stuff and a great introduction to this style of music. This is a classy rock and roller. The vocals make me think of Elvis Presley in a lot of ways. I dig the old school blues vibe on this cut. This is great stuff. The guitar solo is purely on fire. This is an old-school Johnny Cash classic. I love this number. It's definitely a highlight of the set. The horn adds a lot to this cut. It's a killer cut that works really well. This is a smoking hot old school rock and roller. Here we get another that calls to mind Elvis Presley. Another smoking hot old school rock and roller, this is fun stuff. This is a classic song that's been redone by a lot of people over the years. In fact, the next song on this set is a different version of this cut. I think the first version I ever heard was from UFO. Obviously this is different. It's a slow moving old school rock and roller with a lot of blues built into it. Here we get Elvis Presley doing the same song. This one has a lot more pep and energy to it. I like this one a lot. I'm not even a fan of Elvis, but I like this. More along the lines of something Jerry Lee Lewis would do, this is solid stuff for sure. It's a lot of fun. You really can't argue with Carl Perkins. The man was such a big part of the guitar sound of early rock and roll. As you might guess, this is a killer rock and roller with some classic guitar soloing. The energy and groove on this is solid. The cut isn't as strong as some of the rest to my ears. Still the guitar soloing is classic. Here we get a cut that's much more pure old school blues. This rock and roller is solid stuff. It has some killer guitar soloing. It's a slower, more stripped back piece. The cat of the title is heard at the start and on the outro. This is a mean rocker that's classy. There's a lot of country in the rockabilly sounds here. The instrumental tune has some particularly tasty guitar soloing. A killer blues rocker, this is another tasty slab of old school music. While the vocals aren't as deep as the reference would suggest, this makes me think a lot of something that Johnny Cash would do. There is a bit more of an old school rock and roll vibe to it, though. You can't go wrong with the down and dirty blues of Howlin' Wolf. This is exactly what you'd expect, and that's a good thing. This one lands pretty thoroughly in the country vein. It's another that calls to mind Johnny Cash a bit. This rock and roller is classic guitar based goodness. It's an instrumental that has some great soloing. I dig this one. It's the kind of thing that George Thorogood does these days. In fact, I'd say that Thorogood really learned a lot from this song. It has some smoking hot fast paced guitar soloing and a screaming vocal line. This is one of the highlights of the set. This sounds a lot like Elvis Presley to me. There is perhaps a bit of Roy Orbison in the mix, too. It's a solid old school rock and roller however you slice the reference points. There is some cool old school rock and roll here along with some country music. I dig this old school rock and roller. It's a bit weird, but very cool. I remember this song from "Star Trek: First Contact." This is a different version than the one they used in there. I like this, and it has a killer guitar solo. I prefer the other one, though. This one is solid, but definitely not a standout. I dig the old time rock and roll sound on this. The horn adds a lot to the mix, too. This is a swinging rocking kind of thing. This instrumental is classy.